Not to be confused with V8 Ghost, a 2-door car in Grand Theft Auto: Liberty City Stories. The Ghost obtained from "Gone Fishing", as seen in the PC and Xbox version in GTA III. A PC version recreation of the Ghost in its PS2 form, showing the police blue texture. 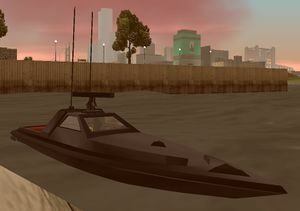 The Ghost (or GHOST missing) is a modified variant of the Predator police boat in Grand Theft Auto III. While largely similar to the Predator, the Ghost noticeably lacks the Predator's twin machine gun emplacements but outperforms the Predator in speed and turning. The boat appears only during the mission "Gone Fishing", in which the player is tasked to kill a target at sea, who attempts to escape using the boat. However, if the player chases the boat long enough, the boat will run ashore from which Claude can kill him. If the player does this they can shove the boat back into the water and drive it. The boat's default color is police car blue, however it is spawned in an unique black color in the PC and Xbox versions of "Gone Fishing". 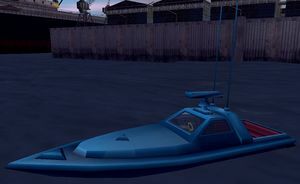 The reason the name "GHOST missing" appears in the PS2 version upon entering the boat is because there's no valid text entry for the boat, so game combines its model name ("GHOST") with the word "missing". Rockstar has fixed this error in the other platform versions, and gave an in-game name to the boat. This error can happen to any vehicle if they do not have valid text names, for example "IDAHO missing". This page was last modified on 4 July 2013, at 08:12.